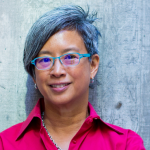 Bio: Ann Mei Chang is a leading advocate for social innovation and author of LEAN IMPACT: How to Innovate for Radically Greater Social Good (Wiley, Nov. 6, 2018). As Chief Innovation Officer at USAID, Ann Mei served as the first Executive Director of the US Global Development Lab, engaging the best practices for innovation from Silicon Valley to accelerate the impact and scale of solutions to the world’s most intractable challenges. She was previously the Chief Innovation Officer at Mercy Corps and served the US Department of State as Senior Advisor for Women and Technology in the Secretary’s Office of Global Women’s Issues. Ann Mei currently serves on the boards of BRAC USA and IREX, is a nonresident fellow at the Brookings Institution, and is a visiting fellow at the Center for Global Development. She earned a Bachelor of Science degree in Computer Science from Stanford University, is a member of the Aspen Institute’s Henry Crown Fellows’ class of 2011, and was recognized as one of the “Women In the World: 125 Women of Impact” by Newsweek/The Daily Beast in 2013. I taught myself to code at the age of 12, studied computer science in college, then worked for 23 years in Silicon Valley. However, in my mid-twenties, I made a decision to spend the second half of my career working for social good. As that transition point approached, I sought out roles that got me closer to my chosen focus on global poverty, such as leading Emerging Markets at Google. Then, made the leap by joining the State Department through the Franklin Fellowship Program. If you want to do something mission-driven, take it as seriously as you would something that is profit-driven. Doing *some* good is not enough. Aim high, take risks, and measure imoact so that you maximize both the breadth and depth of your impact. At Google, when I started leading the mobile engineering team our revenues were about $50M annually. Despite that, we set an audacious goal of becoming the next billion dollar business in the company and reviewed our progress weekly. With the release of the iPhone and Android, along with an amazing team that leapt at each new opportunity, we achieved our goal in only three years. Why is innovation for social good just as necessary as innovation for business? The point of innovation is to create something that is better, faster, or cheaper than what exists today. We have so many long-standing societal ills – from poverty, toinjustice, to environmental degradation. I’d argue there’s nowhere that innovation is more needed. The biggest factor is the nature of funding. Rather than invest in the potential for future growth, most donors care about tangible, predictable results. Thus, nonprofits are forced to operate more like utility companies than startups. This makes it hard for them to experiment, take risks, and pivot – all essential elements of innovation. In addition, there are also a number of innate challenges in the types of problems we tackle. Measuring impact is much harder than measuring e-commerce purchases, our instincts can lead us astray when serving people very different from ourselves, and experimenting with vulnerable people requires great care. What inspired you to transition to the social sector after a long business career at Silicon Valley tech companies like Google? I decided to make this transition almost two decades earlier. In 1995, an executive at Apple named Elizabeth Birch left her job at the age of 38 to become the Executive Director of a nonprofit, the Human Rights Campaign. I’d never heard of anyone doing something like this, and it opened a whole new window of possibilities to me. I decided then and there that I would make a similar switch and spend the second half of my career in the public or social sector doing something to make the world a better place. How can Silicon Valley approaches to growth and innovation also help accelerate social impact? Everyone seems to look towards Silicon Valley for ways that technology can help solve social challenges. While the potential for tech is tremendous, I believe there’s an even greater potential for us to learn from the techniques that have led to the breathtaking pace of progress coming out of the tech industry. For over 50 years, Moore’s Law has accurately predicted that the number of transistors on a chip would double every two years, delivering exponentially greater computing power. Imagine if we could even capture a fraction of that progress for social good. This starts with setting more audacious goals, is enabled by embracing risk-taking, and becomes reality through fast experiments that drive learning. Altruism is one of the best human qualities and motivators for social good, but what does it need to be complemented by to create social impact? Generosity is a beautiful human quality, but it’s not sufficient in itself. We also need to focus on effectiveness. The unfortunate reality is that a lot of the time and money we donate makes us feel like we are doing good, but doesn’t necessarily make a lasting difference. For example, giving to an orphanage might feel satisfying as we can see the real suffering we are alleviating. On the other hand, in some countries this has created an incentive for healthy parents to give up their own children in hopes they can have better lives. Even worse, kids may be kidnapped to meet the demand. Thus, generosity must be paired with another virtue, humility. This means switchingour focus from how much we give to whether we are making a lasting impact. How can social sector organizations apply a lean approach to thinking differently about their finance models? One of the three pillars of social innovation is growth. The difference we make is based on both the depth and breadth of our impact. If deliver significant impact, but only for a tiny fraction of those in need, are we really moving the needle? Too often, scale ends up being an afterthought – something organizations only consider after they have proven an intervention works. But, the engine for growth should be an essential element of the core design. If a solution works, but is too expensive to scale, it may need to be entirely redesigned and retested. Thus, Lean Impact encourages us to test our growth hypotheses early on, along with value and impact. What challenges did you encounter and what results did you achieve when you were chief innovation officer at USAID? As with any large institution, there is inertia both in the culture and the procedures. Change takes time. We built support by seeking out early adopters – established leaders across the organization who saw the need and were willing to take some risks – and partnered with them to adopt new technologies and new ways of working. As they started demonstrating successes, they ended up becoming our best evangelists among their peers across the agency. How could people in the private sector benefit from reading this book? If you’re at a private sector company that is mission-driven, Lean Impact approaches will help you deliver on both profit and purpose in a meaningful way. Lean principles make lots of sense for organizations, but how might a socially conscious individual apply them to create social change in their own community in some small way? Bringing Lean Impact into your community can be as simple as asking an organization you volunteer with or donate to this essential question: “How do you know what you’re doing is working and are there ways you can do even better?” Look for opportunities to question the status quo, try something different, and scale what works. What might our world look like if everyone started applying lean principles toward social good? I believe we’d see dramatically better solutions for the problems plaguing people and our planet. We would embrace a healthier mix between addressing short-term needs and investing in longer-term transformation. Ultimately, our pace of progress would start to catch up with the accelerating pace of change around the world.